Registered heraldic devices and badges are subject to a fair amount of artistic variation and differing interpretations, but when you get to un-registered badges, things can get really out of hand. The youth combat marshalate is a case in point, with at least five different badges in circulation, none of which have been registered. The first two of these seem to be in widespread use, while the others only show up in solitary cases, presumably invented on the spot because someone couldn’t find an officially-registered badge. Sable, two swords in saltire and in chief a label dovetailed Or. 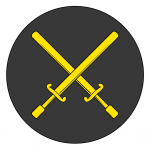 The first uses the standard crossed-sword badge of the Knight Marshalate, adding a label in chief, which in English armory was a standard way of differencing the first heir’s device from his father’s. This is the version shown on the cover of the SCA’s current Youth Combat Handbook as well as on the Middle Kingdom’s YC DEM page. 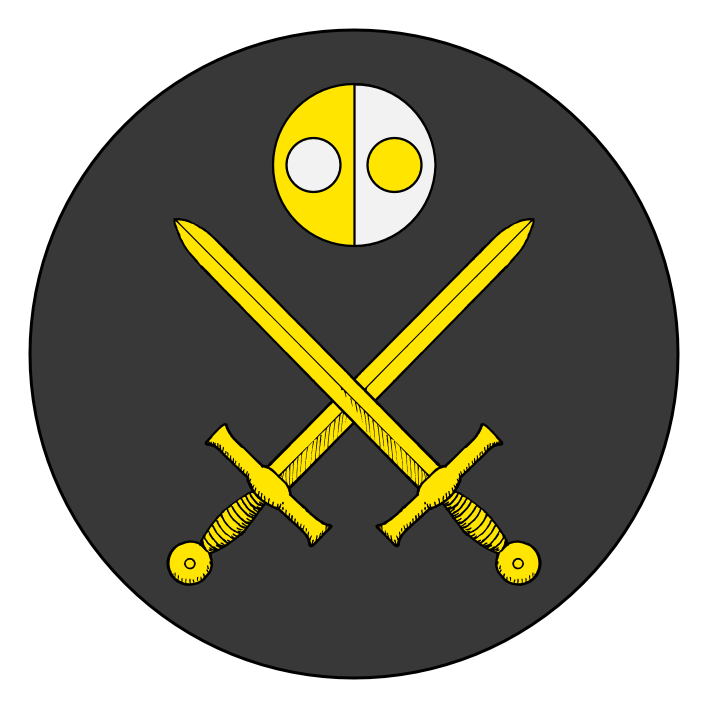 Sable, two swords in saltire Or, and in chief a roundel per pale Or and argent bearing two roundels counterchanged. The second is similar, except instead of the label in chief it bears a small version of the Youth Minister’s badge, with purple replaced by gold. 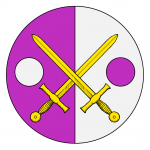 This version appears on the websites of the East Kingdom Earl Marshal and the Earl Marshal of Æthelmearc. Sable, two boffers in saltire Or. A third resembles the crossed-swords badge, but replaces the swords with “boffers”, the padded rattan weapons used in youth combat. This version is found in the East Kingdom graphics library. Per pale purpure and argent, two swords in saltire Or between two roundels counterchanged. 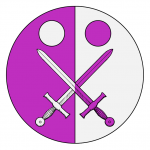 A fourth superimposes the golden crossed swords on the Youth Minister’s purple and white badge. This version is found on the list of Officers of the Barony of One Thousand Eyes (SE Idaho). The fifth also uses the Youth Minister’s badge as a base, but counterchanges the swords and moves the roundels to be in chief. This version is found on the list of Officers of the Barony of the Angels (Los Angeles CA). [Update, April 2019:] This badge was actually registered in 2002 by Bridget Lucia Mackenzie of Caid, and then offered for transfer to the Society in 2003, but the transfer was declined in February 2004 on the grounds that the Society Marshal did not wish to define a Society-wide badge for youth combat; it remains registered to Bridget Lucia Mackenzie. In addition to these, there are probably others floating around out there that I haven’t encountered yet. 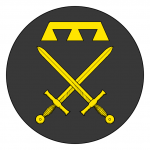 The first of these is my favorite, as it’s easy to read as “heirs to rattan combat.” I’m less fond of including the youth ministry’s emblem, as the youth combat program comes under the authority of the marshalate and is not part of the youth ministry. And while the boffers shown in the East Kingdom’s version are cute, I worry that at a distance a viewer would be hard pressed to know that they were foam weapons as opposed to another style of sword. I’d love to see that first version registered or otherwise more formally standardized so that there was less ambiguity here, but in practice it seems this is not likely to cause any real confusion.